This Thursday, to be precise September 16 at 14:00, XGI will be organising a big event at the Beijing State Guest Hotels in China : XGI will be officially launching the Volari product line in China. We had the opportunity to learn about some of the products that will be unveiled to the Chinese market and wanted to let you have a sneak peak at what will be showcased. It also is the occasion for us to look more in detail at the Volari cards, especially the Volari V8 model. XGI Technology’s product line consists of three discrete GPUs : the Volari V8, the Volari V5 (both of which are also available in a higher-clocked ‘ultra’ version) and the Volari V3 entry-level desktop GPU (which is available in two flavours : V3 and V3XT). 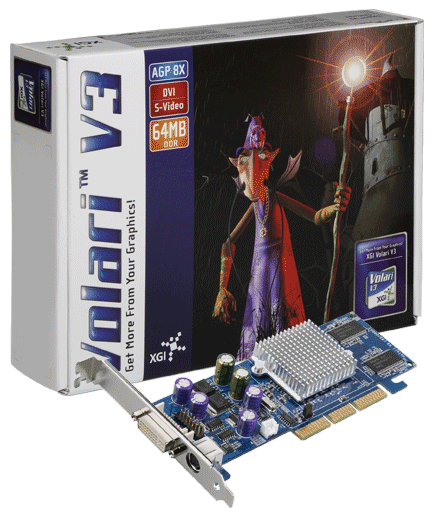 The Volari V8 is XGI’s high-end graphics solution. Clocked at 300Mhz, this 90-million transistor Directx 9.0 chip can support up to 256MB of DDR or DDR2 memory. 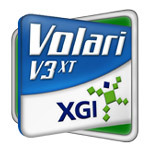 XGI’s Volari V8 board will come with 256 MB DDR memory and will ship with Volari Reactor 1.06.50 drivers. It seems Lian Guan will be unveiling at their Volari V8 Ultra card which will be clocked at 350 Mhz instead of 300 Mhz. As you can notice from the pictures above, the card does not require any external power supply, whereas the version supplied last year required an external power supply. This goes to show that the core has been heavily tweaked since and can now be powered only through the motherboard. - Reactor Unified Driver: The Reactor unified driver works across all graphics boards incorporating Volari V8 and V5 processors, that makes driver management virtually effortless. - ColorAmp Engine : The Volari V5 features XGI’s cutting-edge ColorAmp Engine – driven by a proprietary algorithm that analyzes on-screen environments and automatically optimizes color intensity and gamma levels to provide the most accurate on-screen color and display brightness. 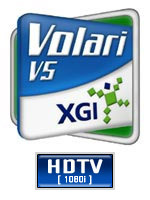 - Cipher Video Processor : Volari V5 processors feature XGI’s Cipher video processor. This advanced de-interlacing technology makes video playback smooth, flicker-free and fluid. And unlike competing video processors, the Cipher video processor converts both incoming and outgoing video feeds, ensuring that all your videos are displayed with the highest possible on-screen quality. - Intelli-Vision Engine : The proprietary Intelli-Vision Engine makes calculated adjustments to display brightness when entering 3D mode, providing clearer and sharper graphics display. Let’s take a look at the performance of the Volari V8 now. All tests were run twice. The benchmark results clearly show the superiority of the Volari V8 over the GeforceFX 5700 LE, both in Direct3D and in OpenGL. The difference is the most obvious in Call of Duty where the Volari V8 outperforms the FX 5700 LE by nothing less than 20 fps! As for the Volari V8 Ultra, we can see it outperforms the Radeon 9550. The Volari V5 is functionally identical to the V8 chip with the exception of its pixel pipelines and shaders. The V5 uses only four pixel pipelines and two pixel shaders. In all other respects it is equivalent to the V8. - Intelli-Vision Engine : The Volari V5 processor’s proprietary Intelli-Vision Engine makes calculated adjustments to display brightness when entering 3D mode, providing clearer and sharper graphics display. - Thema Video Engine : State-of-the-art video de-interlacing (beyond Bob-and-Weave). - UltraClear TFT image quality at UXGA panel resolution (1600×1200). The Volari V3 supports DirectX 8.1 in hardware and is software compatible with DirectX 9, whereas the Volari V3XT fully supports DirectX 9 in hardware. There are 2 models of the Volari V3 : the Volari V3 and the Volari V3XT. - ColorAmp Engine : The Volari V3XT features XGI’s cutting-edge ColorAmp Engine – driven by a proprietary algorithm that analyzes on-screen environments and automatically optimizes color intensity and gamma levels to provide the most accurate on-screen color and display brightness. - Cipher Video Processor : Volari V3XT processors feature XGI’s Cipher video processor. This advanced de-interlacing technology makes video playback smooth, flicker-free and fluid. And unlike competing video processors, the Cipher video processor converts both incoming and outgoing video feeds, ensuring that all your videos are displayed with the highest possible on-screen quality. - Intelli-Vision Engine : The Volari V3XT processor’s proprietary Intelli-Vision Engine makes calculated adjustments to display brightness when entering 3D mode, providing clearer and sharper graphics display.